Metropolitan Waste, Inc. of Augusta, Georgia, provides commercial waste removal and garbage collection services for apartment complexes, residential neighborhoods, and business districts. With more than 30 years' experience providing sanitation services and commercial garbage services, Metropolitan Waste, Inc. holds contracts with the city of Augusta and is one of the most reliable waste removal companies in the area. Locally owned and operated, our entire sanitation team has more than a stake in the community—we are a part of the community. From weekly garbage pickup and waste management services to commercial waste removal for restaurants and shopping centers, our commitment to keeping clean the streets of our community is absolute. WE PROVIDE AFFORDABLE, DEPENDABLE, OUTSTANDING SERVICE! With scheduled pick up times throughout the area, we're the sanitation team to call when you need to have the waste removed from your commercial property. 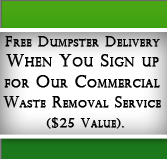 Call us today and let us fulfill your waste management needs. our commercial waste removal services.